Peter Sunde has been to Kosovo before but never to Prizren. Before the start of DOKU:TECH 2015 I took a long hike up to the Kalaja e Prizrenit with Peter. I made the mistake of taking the long way up to the Fortress – according to my Fitbit it was about 4 miles – so we had a long time to talk. We talked about everything from his time in prison to his lovely niece to his dislike of body modification. Our discussion made me curious about how he would bring to a close the first day of DOKU:TECH 2015. 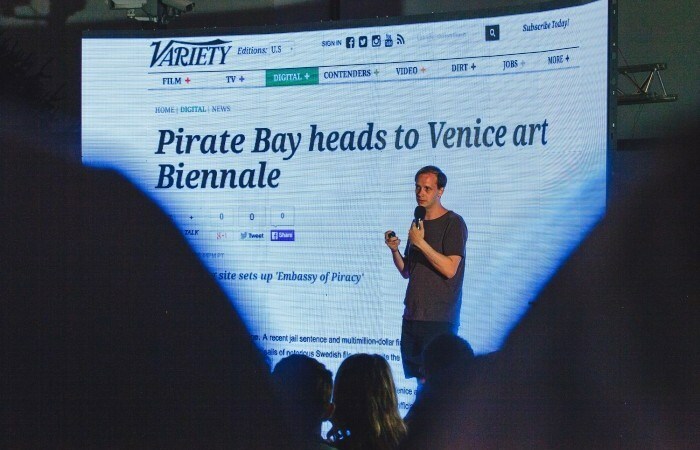 Peter began his talk with a summary of the history of Pirate Bay. They did not launch to ‘take over the world’ but instead took the simple decision of not shutting down their file sharing site as other sites shut down over protests and requests from the entertainment world and their lawyers. They refused to honor the cease and desist documents from the ranks of Hollywood lawyers. With each volley from the lawyers the Pirate Bay team responded with remixes, protests and pranks. Eventually the government of Sweden shut down Pirate Bay. Protests started with the slogan – “Give us back the server or we are going to take your fax machine.” This was as much about freedom and copyright as it was an inter-generational battle. For Peter this inter-generational battle begins and ends with a discussion of morals. What are the things that are happening now – all those future predictions that Yanki and Laurent discussed – that are raising moral questions? Who is discussing the issues? Where are the discussions happening? Are there political leaders having these discussions? We need people with hearts and morals to engage in difficult discussions about the impacts of technologies. Cue the political ad for Peter running for office – let’s have the discussions as part of the political debate and not imprison people to stifle debate and discussion. Tell us about your article in Wired? Peter – I’ve been very pessimistic of the start up space. This idea that Internet and technology will solve all our issues. How we solve problems is in the physical world. There is no app to solve the worlds problems. I believe we’ve lost the war for an uncensored Internet. But we keep deluding ourselves that we are winning battles against different legislation. What can we common people do to stop surveillance? Peter – I don’t think we can stop it. You cannot solve the problems of capitalism with more capitalism. If you want to be productive do something totally different that has nothing to do with it.